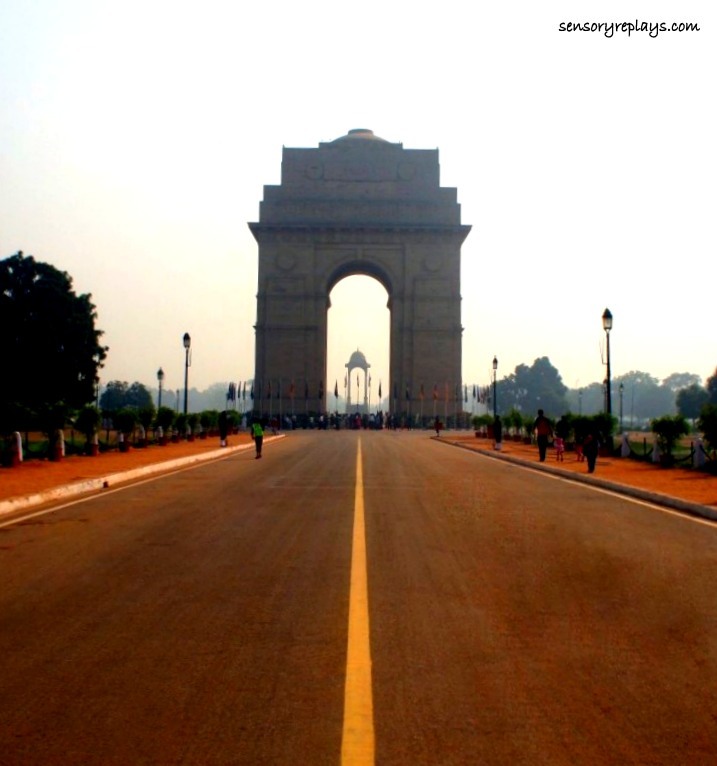 it was my second day in delhi when i visited india gate, india’s national monument. 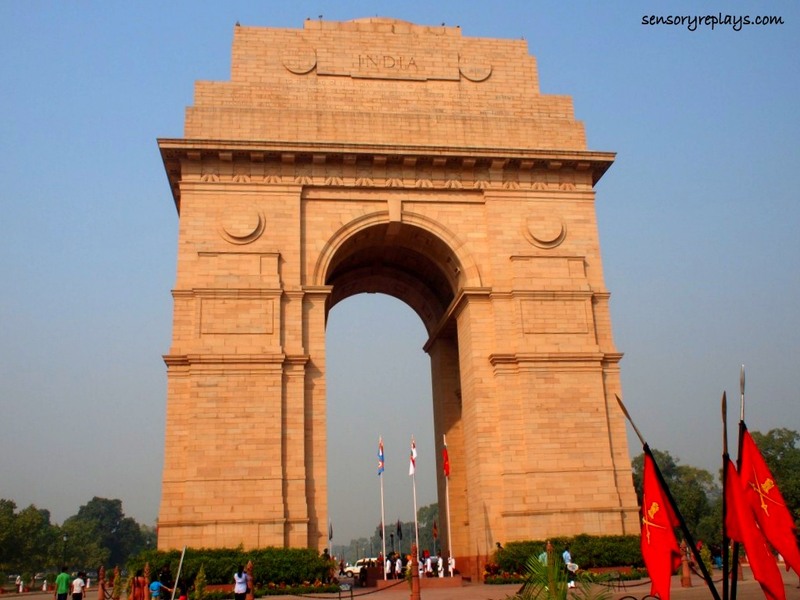 i hailed an auto rickshaw near the hotel i was staying and told the sikh driver to drop me off in this monument and wait for me. i took random pictures as i walked around. 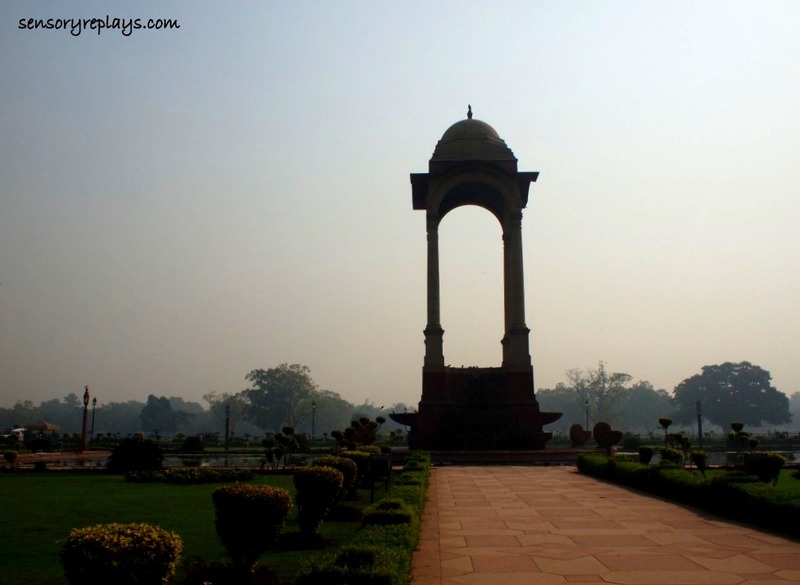 a prominent landmark in delhi, i have read that it was built in the 1930’s. 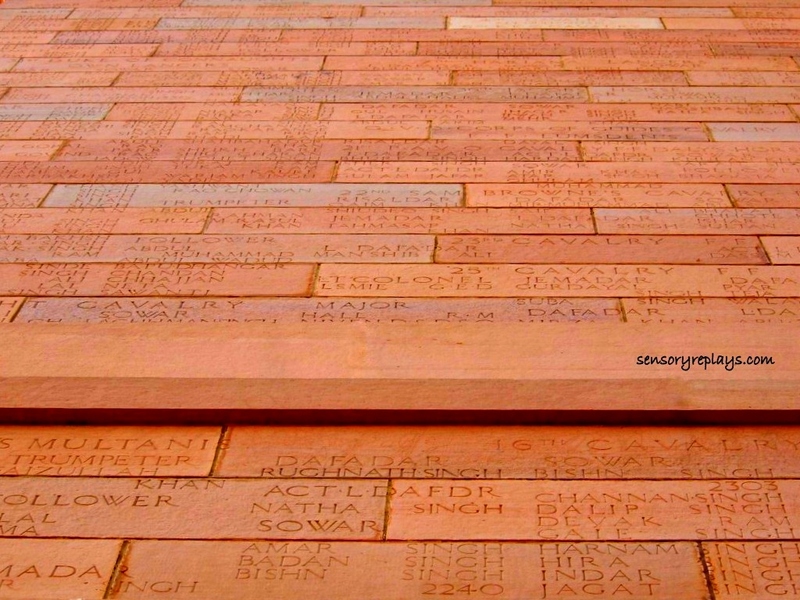 it commemorates the soldiers of the british indian army who lost their lives in world war one and the anglo-afghan war. 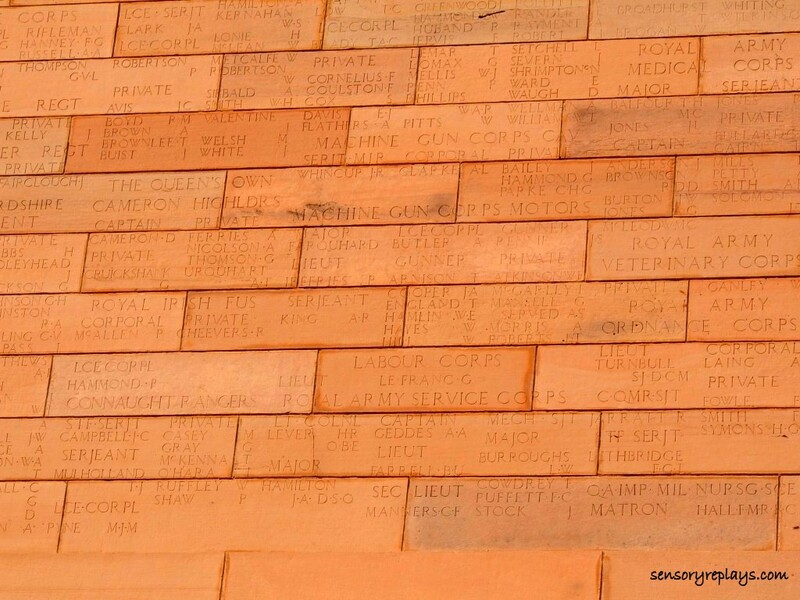 engraved on its pale red sandstone are the names of the soldiers. 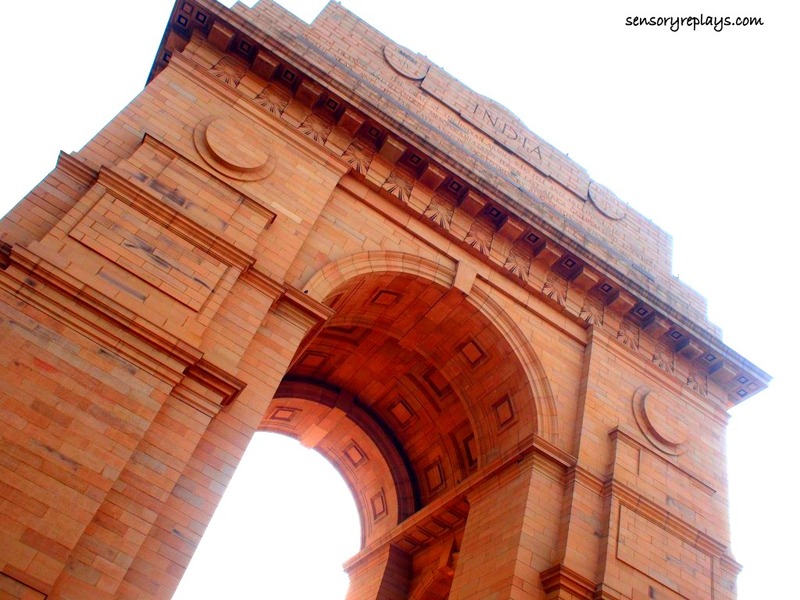 behind the gate is a canopy, also made of sandstone. 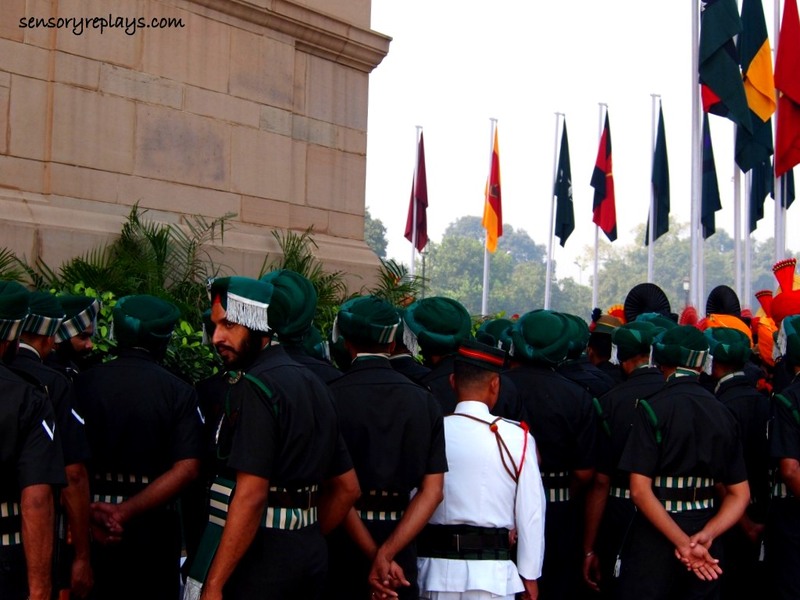 there were these soldiers wearing their traditional uniform. 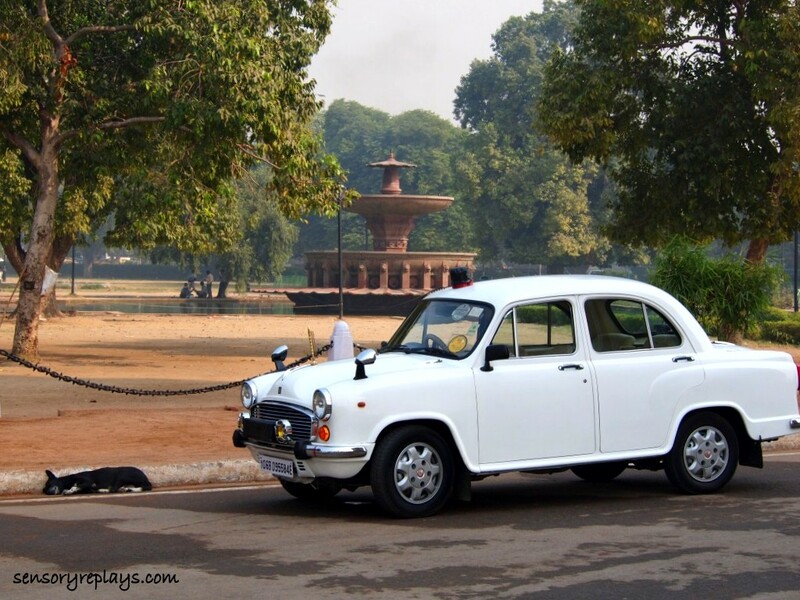 i also took a picture of a sleeping stray dog which i noticed are common in the delhi streets and a classic car. 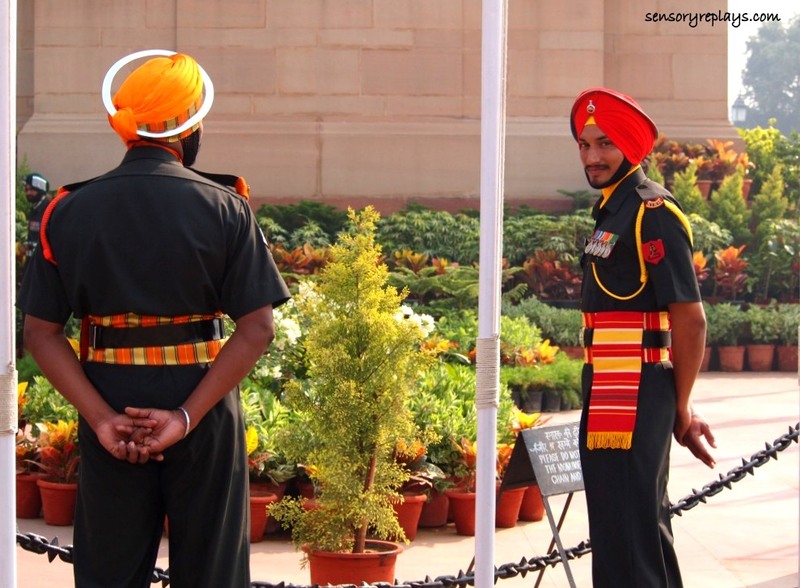 a soldier caught me taking his picture, but i did asked for permission after the shot, lol! 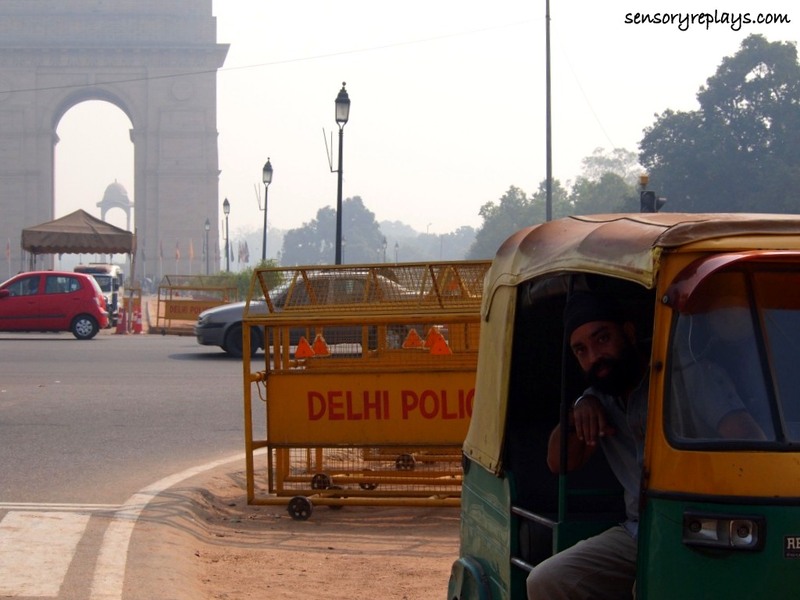 i went back to the auto rickshaw of shamu, the sikh driver whom i asked to wait for me then offered him 500 indian rupees to show me more of delhi. 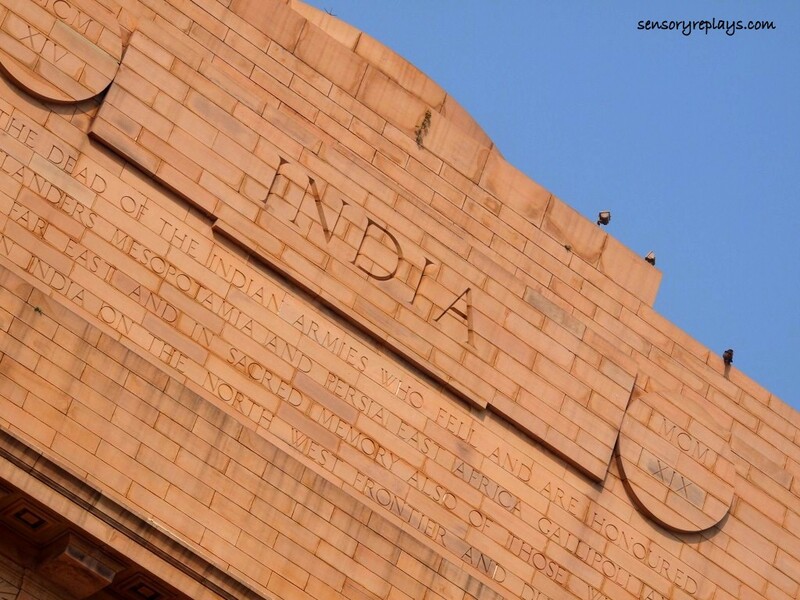 This entry was posted in been there and tagged auto rickshaw, delhi, india, india chronicles, india gate, india gate canopy, indian soldiers, lone travelling, sir edwin lutyens, solo travel. Bookmark the permalink. i wonder how would you react if in case that soldier who caught you taking candid shots of them yell at you to halt and confiscate your passport and olympus pen. that white vintage car is handsome! .. i’ll pee in may pants, haha! actually, he was too ‘decorated’ and smart looking (as in plantsado ang itsura di ba?!) so i never thought it that way. .. i had an odd encounter with a local at agra who confronted me on taking ‘dirty pictures’ in the railroad station. will blog about it soon. si ms. grace nasa europe, ikaw naman nasa india. hmm, di ako naiinggit. di ako naiinggit. di ako naiinggit sabi eh hahaha! btw, thanks, rob, for being part of my blogging journey. .. pangarap ko rin ang europa miss n! kay grace barya lang yun e, hehe. .. happy anniversary to your blog miss n, at salamat din sa iyo. anong kulay nireng gate kuya, reddish orange? ang ganda… next year talaga go kami sa india, ang mura ng fares via srilankan air! .. actually lighter ang color (inedit ko na kasi, hehe!). mas mura talaga kung manggaling ka dito sa middle east papunta sa india, pero pag galing manila sa PAL as much as 25k one-way manila – delhi! .. mura na yun sa price na yan. 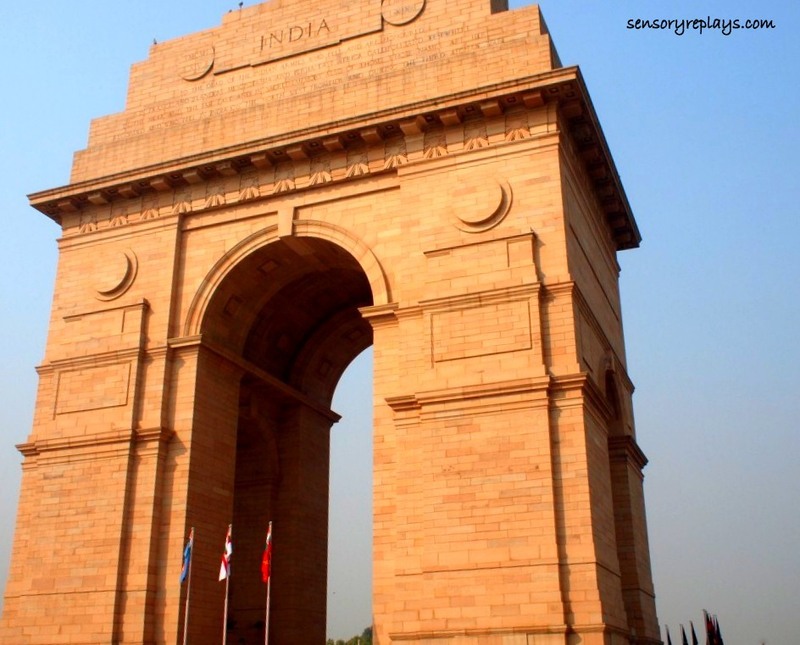 planuhin mo maigi lea, kung gusto mo ikutin ang delhi kulang ang isang araw! ako ang dami ko di napuntahan at napagod na ako agad. the soldier did not look threatening after you took the pic. i think he liked being photographed LOL. .. yeah bert, he doesn’t look threatening at all! i see you also got hazy skies. how was the weather?